Make the evening all the more memorable with this Badgley Mischka ball gown that'll have you feeling (and looking) like royalty. Style with Oscar de la Renta's Golden Black Short Tassel Earrings to complete the look. Sized: 0-12, three lengths available. Petite measures 56" from shoulder to hem (recommended for heights under 5'2"), Regular measures 58'' from shoulder to hem (recommended for heights 5'2''-5'6''), Long measures 61'' from shoulder to hem (recommended for heights 5'7''-5'11''). Red mikado (100% Polyester). Gown. Strapless. Straight neckline. Hidden back zipper closure. Pockets. Boned bodice. Fully lined. See size and fit tab for length. Imported. 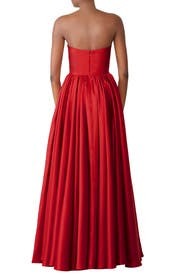 This dress is so dramatic- it's fun and easy to wear but be prepared for wedding dress large. I wore on Halloween and went as Liz Taylor. 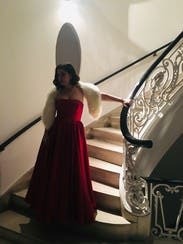 It's very old Hollywood. It's not easy for a short woman to get up and down stairs- but worth it! I am between 10/12 and the 12 was way to big. The color is amazing. Gorgeous gown that fit true to size. Length is perfect for 5'10" with 3 inch heels (8L). Bodice was slightly tight but I am wide - for the average 36c it's likely a perfect fit. 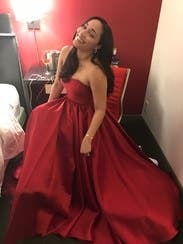 It was a "Belle of the Ball" gown! "BAM!" This dress was stunning! I received compliments all night. Everyone stopped me to comment on how stunning the dress was. I am 5'10", 140lbs, and a 34C. The dress is true to size. I wore 3.5" high heels. The dress was too long for me to wear flats, but it was just a little high off the ground with my heels. Not noticeable to anyone else though. The skirt is big, which made it so elegant. 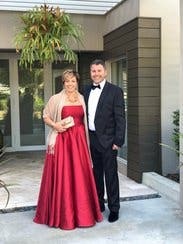 Walking was fine, but sitting/standing up at dinner was a little tricky (dress kept getting stuck under my heels/chair). Getting into Uber took some finesse, too. It was not heavy to wear. 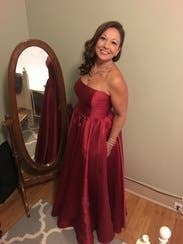 I wore silver/diamond jewelry, and it looked great. I ordered two different dresses in two different sizes because back up sizes were not available. I am between a 10 and 12 primarily due to larger bust size- 38D. I ordered this dress in the 10R and specifically chose this dress based on reviews and photos of women with larger busts. It would have been a great dress had it fit. It is a gorgeous dress but I could not get the back to zip even with help of two different people. I don't even have a very wide back but there was no give in the fabric. I was unable to wear this dress. 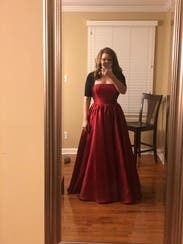 The other dress I chose (12) was too big so I wasted a lot of money and was unable to wear either. Very disappointed with RTR this time. I loved this dress so much. 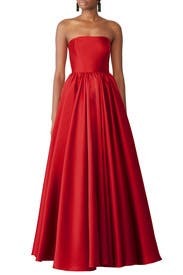 The color was divine and the depth of the dress (and pockets) was stunning. My biggest complaint and reason it did not get 5 stars was that it was so silly long! I wore 6in heels and still could barely walk given that it was still dragging on the floor. There were so many layers that to walk I would have to hold the dress up. If you are 5'10 or above it will work if you wear heels but if you are 5'4 like myself, even 6in heels will be hard to navigate! This dress certainly stands out at the party! Got tons and tons of compliments. Fits true to size other than the length. 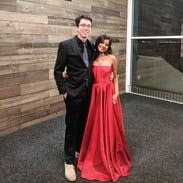 I'm 5'3" and needed to wear a 4" platform heel so that the dress didn't drag the ground. This dress was amazing! A real showstopper! It was a the perfect length with heels and I felt like a queen. I toyed with different jewelry options and everything worked simple or statement jewelry. 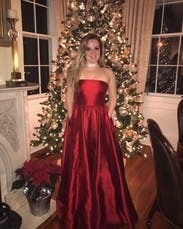 The BEST dress for a holiday function. It was a little difficult to dance in because I'm only 5'3" but not impossible. It's feels sturdy even strapless but not too heavy. Engagement photos taken on winter beach in AK. The color was stunning and the fit was so flattering! Perfect for Engagement Photo shoot. Would rent again for formal event as well. Long. 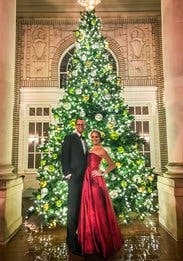 I am 5'5" and without heels the dress was impossible to walk in freely. This dress was absolutely stunning!! I got compliment after compliment. I ordered a size 4 and 6, but ended up wearing the 4. Best part about it- IT HAS POCKETS. I'm a 34c, 5'4". The dress fit perfectly in the busy. Length was a little long, but I had some 2 inch heels that made it the prefect length. Loved this dress! 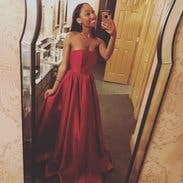 This dress was everything- formal, eye-catching, comfortable, well-made...and pockets!! True to size. The only negative is that it arrived wrinkled since it has so much fabric and is shipped in a small box. Just needed a bit of steam! Felt like the Queen of the ball! 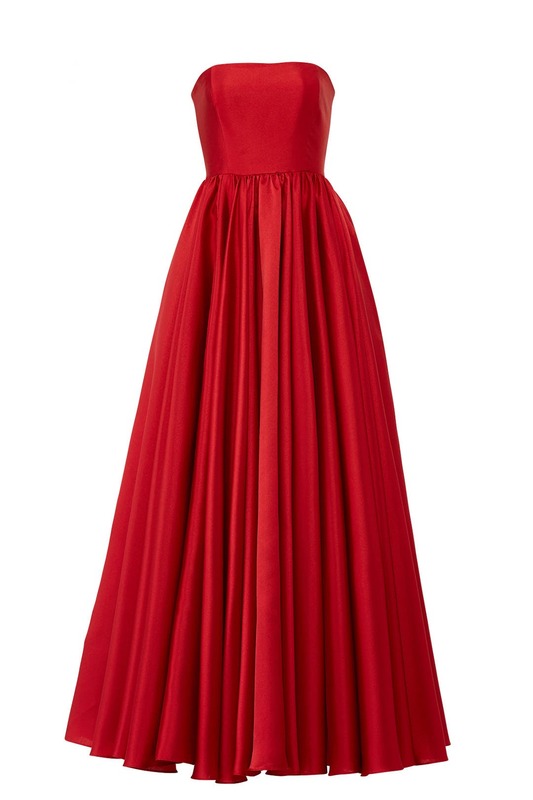 The material and rich red color of this dress are what make it so glamorous! I wore this as the host/emcee at a black tie awards event. Unfortunately, since it was so close post- holidays, the only length that was available was long (I'm 5'5") and I almost tripped when walking or stepping onto the stage, but small price to pay for elegance! I'm typically a 4, but small on top so the 2 fit perfectly snug, and with the weight of the dress I think 4 would have pulled down too much. Unbelievable dress! I saw all the customer pictures and reviews for this dress and fell in love. I love the princess feel it gives you. Super regal but still a movable dress. I was originally super worried about length because all the reviews said it runs long. It does, but with a little bit of heel (I only wore 3 in) it's not too bad. People did step on it at times but it was fine. So so so many compliments! Great if you want to make a statement. Also unlike other dresses, it shows up just as well on camera as it does in person! 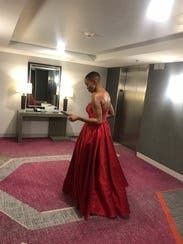 This gown was gorgeous and I received many compliments. The dress was a good length with heels with my 5'5 frame and 135 lb. and it has pockets! 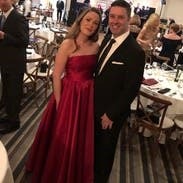 I rented this dress for an "Old Hollywood" gala. It was beautiful and I received compliments all night. 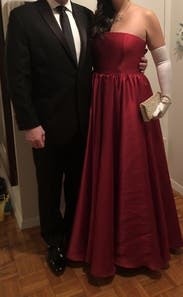 The dress fit like a glove and was also super comfortable! More components then I have every received EVER! Didn't want to take it off! 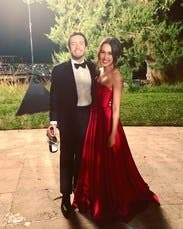 I have rented a ton from RTR and this HANDS DOWN was my favorite gown I've ever worn. I literally didn't want to take it off.. 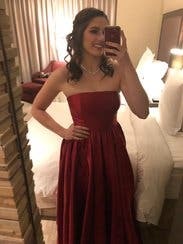 I wore it for my Med schools gala and it was perfect! It is a little long so at 5'2" I had to wear some pretty high heels. The 6R was very slightly longer then the 4R which is the size I ended up wearing! This dress is SO gorgeous! I was not able to wear this dress as it was too long for me. I'm 5'3". So many compliments from strangers! Beautiful dress, if a bit long. Found myself carrying the skirt when I walked, despite wearing 3 inch heels. 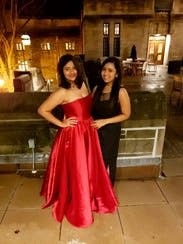 Stunning fit and fabric, incredibly flattering, I felt like a princess all night! My first RTR, but it won't be my last. I'm 6'1" about 175 and ordered the 10L. It fit perfect with my heels which is AMAZING being a tall girl it's nearly impossible to find a dress I can wear heels with and not see my feet. Loved this dress so much it just ran a tad long but I made it work. I am 5'3" and needed 5 inch heels and dress still touched the floor. Also runs a bit large in my opinion. The 0R fit like a glove but I normally wear a 2-4 in formal wear. I am very small chested however (A cup). This dress was stunning! Fit beautifully and was comfortable to wear!! I did need to steam it when it arrived - with the amount of volume to the dress and being shipped with two others it was noticeably wrinkled even after hanging for a day. Perfection!!!! 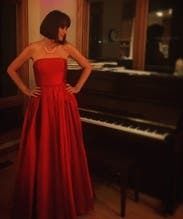 I felt like the belle of the ball! 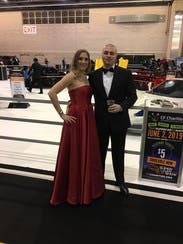 I wore this dress for our Oscars themed awards banquet for my company. It was perfect and I'm still receiving compliments!! The dress fit beautifully and had enough support despite its relative weight. 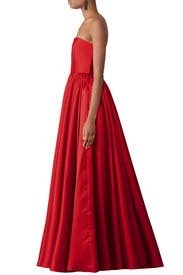 The color is cathedral red, not as bright as I thought per the model's dress. I received so many compliments - was definitely happy with the rental! It's a little heavy than I'd like but this was the perfect dress for my event. So many compliments and I really enjoyed wearing this. Also, incase you can't tell there are pockets! I rented a 12R and 10P I'm 5ft4 150 32DDD and the measurements were more comparable with the 12 but the 10 fit like a dream. The petite option made a huge difference for being a short girl. I wore 1in heals and was comfortable dancing and socializing the night away. 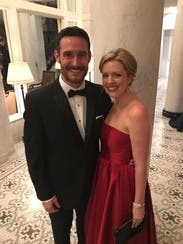 I got so many compliments on the gown and the color but my favorite part of the dress was the pockets that were seriously a game changer for formal events. Stop stressing and just rent the runway. You won't regret it. It even has pockets!!! I loved this dress!! Only thing I would change is the length. It does run a little large in length but everything else is true to fit! This truly is a stunning dress. You must be taller than 5'9" to wear the long, even with heels. The dress is heavy as well. I loved the pockets and the way it fit. 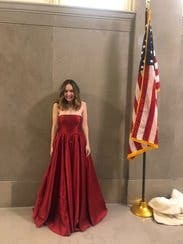 Everyone said I had the best dress at the event! This dress is absolutely stunning. The color is so vibrant and it made me feel like a queen. It definitely runs small in the chest. I am a 32D and I would have been way better off in a 2. I still wore it because it was so beautiful, but I was pulling it up all night. It's also the perfect length. 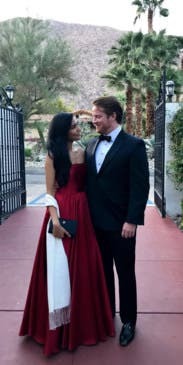 I am 5'10" and no dress has ever been long enough for me, but I was able to wear this one with 3.5 inch heels and it just brushed the floor. Absolutely perfect.